Friday night I watched Elf for the first time. It's a very funny movie! And it reinforced what I said a year ago when I first reported on this movie: that given a serious treatment of the plot, Ferrell could expand on the perception most folks have of him, 'cuz he would prove that he's capable of being a legitimate action star. 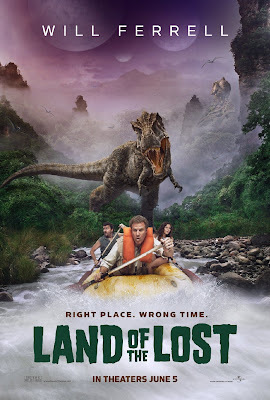 Though from what I'm hearing Land of the Lost is still being produced as a comedy... which the original TV show was anything but. Nice poster. I like the giant carved Sleestak especially. But color me "overly cautious" about this for the time being. I watched "Land of the Lost" on tv as a kid in the mid-seventies. It was on Channel 10 out of Roanoke, Va. They rotated it with "Sigmund and the Sea Monster," another Kroft show.